The art of typography has gone through many evolutions dating as far back as human civilizations in Mesopotamia, Babylonia, and Minoa from the second millennium BCE. Human fascination with written characters, type, and word communications was not confined to this Western-Asia geography. Every civilization across the globe has employed some form of creative use of markings that symbolize letters or words. Words in art from the 20th century to the present saw a slight shift going from mere signatures of the artists to an “integral part of the image.” They were not just used as a period signifying an end to a visual essay, but as part of the visual essay’s structure, composition, meaning, and purpose. During this timeframe, advertising and collage became art forms which often integrated text with design. Cubism, Surrealism, Dadaism, Futurism, Expressionism, Pop art and Post-Modernism were all movements that dabbled with text. Michael Petry, director of the Museum of Contemporary Art London, has pulled this artistic tradition into our contemporary era with The Word Is Art. Featuring a variety of artists, Petry glides through an international array of perspectives on the value of the written word in the context of visual art. Addressing the current digital age of new methods of communication, Petry believes that words remain “critical, powerful, and central to art.” Some things, no matter what form of technology, will never change: people will always use words to communicate; words and art are as powerful as ever; 21st century word-art is increasingly complex and exponentially impactful. Divided into eight sections, The Word Is Art, is organized by medium as well as idea. Each one of the roughly 200 artists is given a paragraph description and an example or two of their artwork. Projects are as diverse as the represented nationalities. There is a Lebanese artist, Zena el Khalil, using mirror tiles, Styrofoam, metal and an engine to make a rotating word, Allah, written in Arabic script, intended to rotate with lights and music to encourage dancing. Referencing the on-going Middle East conflict, A’Salam Aleykum: Peace Be Upon You (2009) has been exhibited in Italy, Germany, Belgium, and England. Japanese artists So Kanno and Takahiro Yamaguchi used an artificial intelligence program and a plotter machine to generate lines that looked like real words in multiple languages but which had no meaning at all. Senseless Drawing Bot (2011) was created using a motorized skateboard, spray paint, double pendulum and other electronics, that rolled along the floor spraying graffiti babel on the bottom portion of the gallery wall. Yugoslavian-born, French national Maja Bajevic used the traditionally feminine art form of textiles and embroidery to comment on the position of women in the art world and the global economic systems. Jorge Méndez Blake, a Mexican artist, used acrylic to paint visual poetry. All of Dickinson’s Hyphens—Poems 351–711 (2016) is part of a series using Emily Dickinson’s punctuation marks, hyphens, and dashes. Iranian artist Golnaz Fathi is a Persian calligrapher who simplifies and abstracts text that only hint at the meanings she wants to reveal. Argentinian, Austrian, Australian, British, Canadian, Chilean, Chinese, Cuban, Dutch, Finnish, Greek, Iraqi, Irish, Italian, Korean, Malawian, Norwegian, Romanian, Russian, Spanish, Swedish, and even an occasional US artist are all among the nations represented. Only Africa seems to be under-utilized. Petry is also sensitive to artistic influences in religion, politics, gender, and power structure inequalities, pulling in artwork and artists that tackle these charged and potent issues. With a net cast as wide as possible over the world of words, Petry’s project actually reins in a concept that is surprisingly basic. We are all people in a digital world that is getting smaller and smaller, using multiple languages that embed emotional, expressive capabilities. 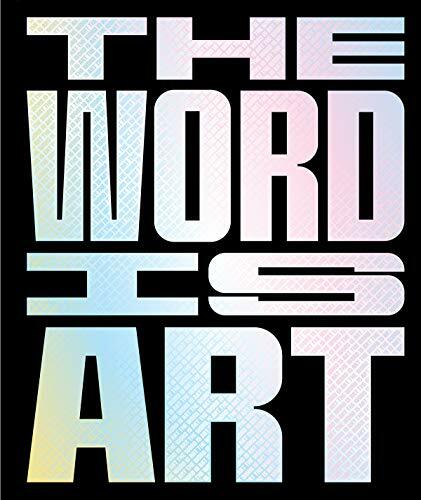 The Word Is Art highlights the unique ability of artists to manipulate different forms of language, and distill them into a common understanding of humanity. Art has always been and will continue to be the great universal communicator.